I woke early and noticed the red tint from outside so I nipped on deck to take a photo from the pontoon of Nomad 1 in the sunrise. A great way to wake up I have to say. A leisurely breakfast, much walking around looking for parts we weren’t quite sure of at the chandlers and we bade farewell to Joe who had to work for a living today. I expected the tide to be full stream at around 0930 and when we cast off we used a bow spring so that as we engaged reverse gear we’d have steerage way immediately. No problems there and we were off up river to practice some ferry gliding. Holding her steady on the tidal stream the log was reading about 0.7kts which is fairly modest. With the engine in forward gear but idling on minimum revs it was just a little too much power and she would edge forward – in neutral she would drop back of course. So it need alternating periodically between neutral and idle to keep her in line with the gap on the pontoon between two other boats. As I turned her to port, she started to move very slowly towards the pontoon – the speed of approach very closely related by that angle to the stream – probably settling on 20°, the tide was now pushing the boat sideways at a comfortable rate. A quick touch and go and we were off up river to practice the same but with shallower waters the stream wasn’t as strong and so not quite so easy to glide across as a decent controllable rate. It is a very leisurely way to enter the finger berths and so therefore much less likely to risk needing to react to the unforeseen when just entering at right angles to the stream – might sense is with stronger streams it would be an essential skill to master. We sailed out of the Hamble on our headsail alone. With very flat waters there was total silence around us – fabulous. As we made our way past Hamble Point SCM we readied the spinnaker again, anticipating a long broach reach back to Portsmouth but just as it got caught as the headsail was furled the wind backed and then died. Motor on for the couple of hours of so back to Gosport. The final practice was a single handed berthing on our hammerhead using a midships spring and then walking her down to our final spot by playing out the spring and repeatedly adjusting the bow and stern lines. I guess if I’d landed her in precisely the right spot I wouldn’t have had to. Log entry. 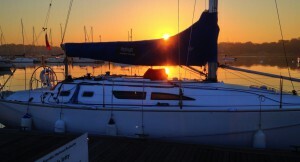 2.5.2013 Nomad 1 Jeanneau Sunfast 37′. Crew. Gosport – Hamble – Gosport. F3, Slight. 50NM tidal.